Here is the first part of a two-part stress relief tips to try to help you feel better about things. As you may or may not realize having those little stresses in your life will eventually add up to real health problems unless you are diligent in removing as much stress as possible in your life. 1. Get up fifteen minutes earlier in the morning. The inevitable morning mishaps will be less stressful. 4. Do nothing which, after being done, leads you to tell a lie. 5. Make duplicates of all keys. Bury a house key in a secret spot in the garden and carry a duplicate car key in your wallet, apart from your key ring. 7. Be prepared to wait. A paperback can make a wait in a post office line almost pleasant. 8. Procrastination is stressful. Whatever you want to do tomorrow, do today; whatever you want to do today, do it now. 9. Plan ahead. Don’t let the gas tank get below one-quarter full; keep a well-stocked “emergency shelf” of home staples; don’t wait until you’re down to your last bus token or postage stamp to buy more; etc. 10. Don’t put up with something that doesn’t work right. If your alarm clock, wallet, shoe laces, windshield wipers ‘ whatever ‘ are a constant aggravation, get them fixed or get new ones. 11. Allow 15 minutes of extra time to get to appointments. Plan to arrive at an airport one hour before domestic departures. 12. Eliminate (or restrict) the amount of caffeine in your diet. 14. Relax your standards. The world will not end if the grass doesn’t get mowed this weekend. 15. Pollyanna-Power! For every one thing that goes wrong, there are probably 10 or 50 or 100 blessings. Count ’em! 17. Say “No!” Saying “no” to extra projects, social activities, and invitations you know you don’t have the time or energy for takes practice, self-respect, and a belief that everyone, every day, needs quiet time to relax and be alone. 18. Unplug your phone. Want to take a long bath, meditate, sleep, or read without interruption’ Drum up the courage to temporarily disconnect. (The possibility of there being a terrible emergency in the next hour or so is almost nil.) Or use an answering machine. 19. Turn “needs” into preferences. Our basic physical needs translate into food, water, and keeping warm. Everything else is a preference. Don’t get attached to preferences. 21. Make friends with non-worriers. Nothing can get you into the habit of worrying faster than associating with chronic worrywarts. 22. Get up and stretch periodically if your job requires that you sit for extended periods. 23. Wear earplugs. If you need to find quiet at home, pop in some earplugs. 24. Get enough sleep. If necessary, use an alarm clock to remind you to go to bed. 25. Create order out of chaos. Organize your home and workspace so that you always know exactly where things are. Put things away where they belong and you won’t have to go through the stress of losing things. You can see from this list that most of the items are just a matter of giving yourself more time or not self-creating stresses. Don’t you think that living a life of less stress would be a great thing for you as well? These are great suggestions. They seem so simple and obvious but people don’t do them probably out of laziness, fear and a perceived lack of time. 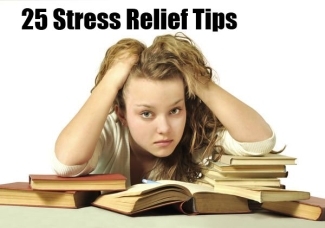 Thanks for spelling it out – stress relief is “in the details”!